Of all my ink, my Medusa tattoo is my favourite. She stands proudly on my left arm, hands on hips, draped in a long flowing skirt. Thirteen blue, black and silver snakes writhe in front of her bare breasts, wrap themselves around her pointed feet, or curl out from her beautiful face, almost feline in its angularity. My skin tells other stories too; a trio of cauldrons, glossy red holly berries, words from an Irish spell, a scarlet and black swirling triskele, and my most noticeable – and colourful – tattoo, nine blood red trumpet lilies wrapped around my right arm and curling over my shoulder, behind which snakes charcoal Art Nouveau ivy tendrils. Again with the snakes, hey? 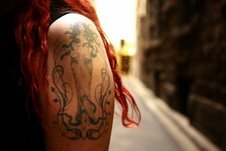 My Medusa tattoo features in my latest story, ‘Rapunzel, Rapunzel’ up now at Memoria. This wonderful podcast focuses on short memoir extracts, ‘micro-stories about the moments that shape us, and how memories change over time.’ I narrate my tale of obsession, regeneration and yes, more snakes, all beautifully produced in a little slice of audio lasting 5 minutes and 32 seconds. So settle back with a glass of red and let me read you a story…and take a wander through the other stories on the site while you’re there. I ran a hand through my hair, falling in deep red waves to my waist. I imagined my snakes as they writhed, glowing in the late afternoon sunshine. It’s all I could do not to reach up and pat them. If you think I’ve finished with the serpent stories, you’re wrong. My lovely Wolf has decided to buy me a snake for my birthday, and we’ve been searching. We have the tank (and a rather alarmed cat, sniffing the scales of the previous tank tenant), and are fitting it out with a thermostat and hide. In Australia you need a licence to acquire one, just in case you were tempted to go out and catch yourself a wild one. My licence arrived on the same day that my Medusa story came online, which also happened to be World Snake Day. Little bit witchy, me. In other writing news, I headed to rural Victoria for some red dirt, kangaroos, a bonfire, and a studio to pour out chapters of my novel. There was also the wonder of my Wolf chopping wood, and the opportunity to mix whiskey with toasted marshmallows, and feel this little cutie snuggle into my mane. I’m also delighted to be part of the Melbourne Writers Festival this year, where sections of my recent Reading Victoria piece on the West Gate Bridge will be adapted for audio, mixed with six other writers’ tales of our home suburbs, and played on the Melbourne Star Observation Wheel in August. To hear the story in its entirety, go to All The Best Radio and listen to their wonderfully produced audio version. Pair that with two more Stereo Stories performances lined up in September, and an invitation to be a panellist at the Write Around the Murray festival in New South Wales, and as always, I’m never short of reasons to pick up a pen. Look at that…I managed to finish this without more references to snakes. I was trying to go to bed when I heard it. I was sitting on the heater – literally – and listening to rain lash the lounge room window behind me. I was warmed as much by the heater as the whiskey which friends had given me for my birthday last week, and did not like the prospect of my unheated bedroom. I had the TV on low and was daydreaming, but when I heard the word it cut through the sound of the rain. It was a character’s name on some late night crime show. I didn’t pay much attention after that. I didn’t need to: I knew I’d get a short story from that one name alone. Birdsong, sliced in half, part German, part English, and to my midnight ears, utterly beautiful. But here’s the thing: I couldn’t see a pen to write it down. All writers know the promise ‘I’ll remember it in the morning’ is tragically and patently untrue, but I couldn’t quite lift myself from the heater to rummage through my writing desk. So I did the next best thing. I reached over to the top of my desk, and took hold of a container of snake skins. I am serpent obsessed. I have snake skins all over my house, and rubber snakes on my windowsills to hiss their protection around my home. I have thirteen of them tattooed down my left arm in blue, black and grey ink, writhing around my Medusa with her hands on her hips and a stare of defiance. I admire the regenerative nature of their skin shedding, and their symbolism often works its way into my writing. I love my snakes, oh yes. I opened one of my containers and took out a coil of skin, shed by a coastal python. And I placed that carefully in the middle of my lounge room floor. That, so my midnight whiskey logic went, will remind me of the word Vogelsong when I wake tomorrow. And it did. I stumbled out in search of coffee, saw the skin, and immediately said to my cat ‘Vogelsong!’ I think she was just as surprised as I was. I nodded, started imagining what kind of character could carry that name, and turned the kettle on. I did not, however, pick up the snake skin. It still felt beautiful on my tongue. The skin has been there for five days now. I’m learning to step around it. I don’t think I’m ready to stop saying ‘Vogelsong’ just yet. The story is still brewing; my focus these last two months has been my novel, so to take up a pen and give birth to an entirely new character, in an entirely new life, is just intoxicating. In the meantime, here’s one that is ready: ‘They broke my name in half’ has just been published in 21D, and is available on Smashwords through the link below. I’ll also be performing at the Newport Folk Festival this weekend. Stereo Stories is a wonderful website that celebrates the stories behind songs, and I’ll be reading about my trip to Jackson, Mississippi in honour of Johnny Cash. The songs will be performed by local musicians alongside the readings, so something for everyone. Head on in, and I’ll do my best to do a southern accent as I read.